Three Pass Design Ensures More Travel Of Flue Gases To Allow Maximum Heat Transfer. Wet Back Design Prevents Uneven Thermal Stresses On Rear Tube Plate And Obviates Need For Refractory Work. 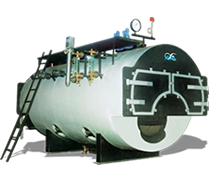 Manufactured As Per Indian Boiler Regulations With Updated Amendments. Maximum Boiler Efficiency With Better Steam Quality. Can Be Easily Converted Into Oil/Gas Firing System. Copyright © 2015 Alfa Entech. All Rights Reserved.